Kyle McLeister (MA ’11) recently finished a six week study tour of Greece as a member of the American School of Classical Studies at Athens Summer Session (http://www.ascsa.edu.gr/index.php/programs/Summer). 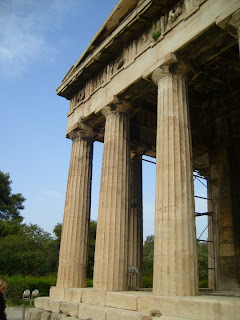 The summer session, which was comprised of 20 students and high school teachers from across North America, divided its time between three weeks in Athens and three weeks travelling throughout the rest of Greece, visiting sites of major archaeological and historical importance, as well as numerous museums in Crete, the Peloponnese, and northern Greece. The program not only allows students to gain first-hand experience with the monuments of ancient Greece, but it also gives them to opportunity to forge professional ties with students and scholars in the field.